Upon your arrival you’ll get a notecard that introduces you to the creator, PinkRayne, her background growing up in UK and spending many hours with her family in the Yorkshire Dales, and in particular in Malhamdale. 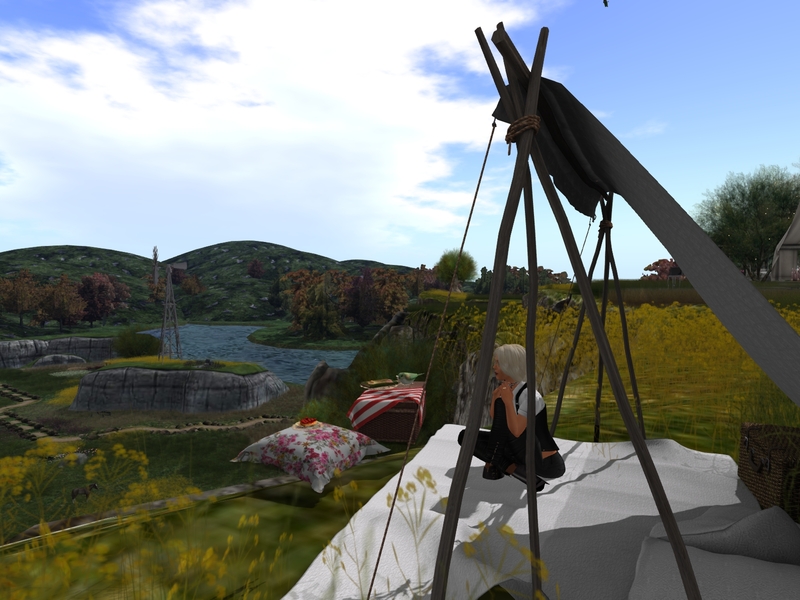 She brought some of it’s beauty to Second Life. “Malhamdale consists of a tiny village and vast amounts of stunning countryside including a cove, tarn and various waterfalls. 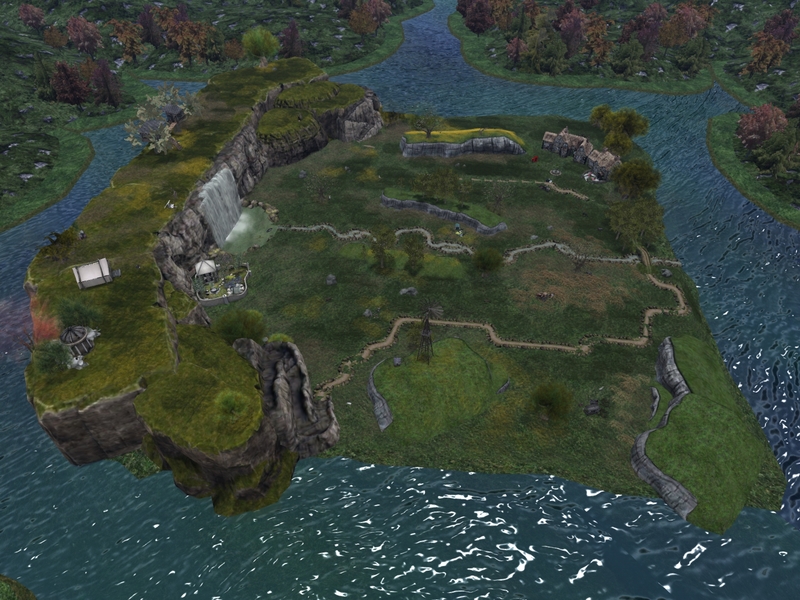 I decided to build Malham village and Malham Cove for this project, the most dramatic features to be seen in Malham. The tiny, rustic village consists of little more than 2 pubs, a tearoom and a newsagents, and opposite this quaint little corner of the Dales is Malham Cove. Malham Cove is a dramatic, curved limestone formation. It was formed at the end of the ice age, 12,000 years ago, by a waterfall carrying meltwater.” (quote taken from the introductional notecard by PinkRayne). 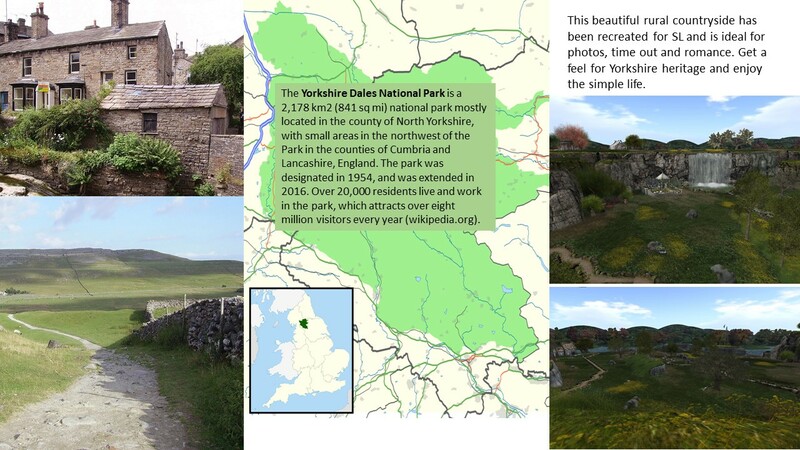 The Yorkshire Dales in SL is a small piece of rural UK, just a few houses, a cafe, a wind mill, agriculture, grazing horses, a high plateau with a waterfall and many places to sit be it to inhale the landscape, to dream or to cuddle. For couples there’s also a gazebo to dance. And that’s it what I did, I walked around looked for spots to take pictures, and I also just sat and gazed into the nature. As it was quiet in SL for me, I listened to music and enjoyed. A great place to wind down. Something I have to share to Mistress Jenny.